I spent my high school years in WV. Although those were decidedly NOT golden years for me – There isn’t enough money in the world to make me go back to high school – I have always been fascinated by the Appalachian culture. Maybe it’s my own Scotch-Irish heritage beckoning, (when the German ancestors aren’t drowning it out) or maybe it’s from reading Catherine Marshall’s book, “Christy,” or John Denver’s “Country Roads” from my childhood? 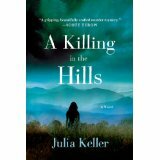 Regardless, I was excited to come across these two mysteries set in “Acker’s Gap, WV” a fictional, but realistic, small town in the mountains. 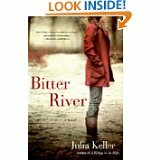 The author Julia Keller lives in WV, so she knows the culture well, and she does not shy away from the plague of rampant illegal prescription painkillers tearing towns apart, not to mention meth and oxycodone. In fact, it’s the basis of her first mystery, centered around an intense prosecuting attorney Bell Elkins whose own teenage daughter witnessed the violence that comes on the heels of drug trade. You don’t always like Bell; she’s had the stereotypical childhood some of us imagine would come from growing up in an abandoned trailer down a dirt road high up in the hills. Yet as she tries to live with integrity, juggling her past, her job, her ex-husband living in DC, her teenage daughter, and her passion for setting things right, well, it’s hard not to root for her. Aren’t we all doing the same juggling, trying to make a difference? Her second book asks we set aside the likelihood of a terrorist clumsily stalking an enemy who fled to Acker’s Gap, but it’s sure a fun scenario to ponder. After all, even though those of us who live in the Greater DC area forget, the Appalachian life is but a few hours away. Again, Bell has to navigate past with present – This time, the emphasis is on her “fancy” DC legal training and the heartache of her daughter living in DC with her ex-husband, alongside the (okay, unrealistic) violence ripping through her tiny town. Again, perhaps not the most realistic of scenarios, but still, the way we see Bell trying to stand on solid ground with everything and everyone pulling on her, well, I can’t help but admire her. In the end, I’m drawn to these mysteries by Bell’s not-always-likable, but always-relatable humanness. I can identify. Sometimes my past (high school drama, anyone?) invades my present, too. Sometimes my single-minded desperation to make things right doesn’t turn out well. Sometimes I unthinkingly sacrifice kindness for progress (of my own sort.) And, since we know so much about how stories light up our brains as though we are the main character, and give us new eyes to see the world, Bell’s life and mind and struggles are a good place to hang out for awhile.